At Butler Ford, when we think of America, we think of bald eagles, stars and stripes, big trucks, and football. Which is why we’re so excited to hear that the NFL has an official truck, and that it’s the truck most of our co-workers drive: the best-selling vehicle in America, the F-150. That’s right: your Sundays, Thursdays, Mondays, and the occasional Saturday just got even better. Ford builds the toughest, hardest-working vehicles on the road or off it, and you can bet the minds that brought us the Focus RS and military-grade aluminum truck bodies has a few ideas about merging football and Ford trucks. For one thing, Ford plans on using this powerful platform to provide NFL fans with a better tailgate experience. After all, who knows tailgating better than the king of towing? 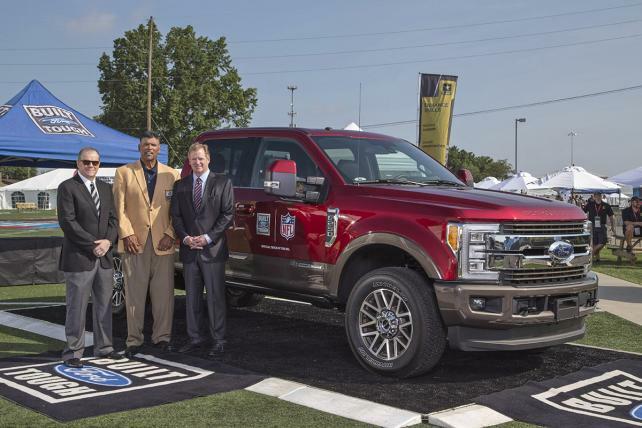 Fans attending games will be able to hail Built Ford Tough Tailgate Trucks, which deliver fans tailgate food, game tickets, and team merchandise in all-new Super Duty trucks. Additionally, Ford will be honoring the NFL’s greatest unsung heroes, offensive linemen. Football players don’t come more military-grade tough than the giants who fight in the trenches to protect their quarterback, yet they receive none of the fanfare that their teammates do. In the spirit of Ford’s focus on toughness, durability, and work ethic, Ford will honor the cream of the O-line crop weekly with its Built Ford Tough Offensive Line of the Week. We were excited enough for football season already. Throw in our favorite trucks? It’s a shame Uber doesn’t deliver nachos to Southern Oregon.